Degree of difficulty: 2 We want the drop of water to make a perfect reflection of the bottom and this happens when it is rising (rebounding). We will launch, carrying a single drop and put a delay on the infrared system that allows the flash to freeze the moment of the climb. Camera on the tripod (as usual). 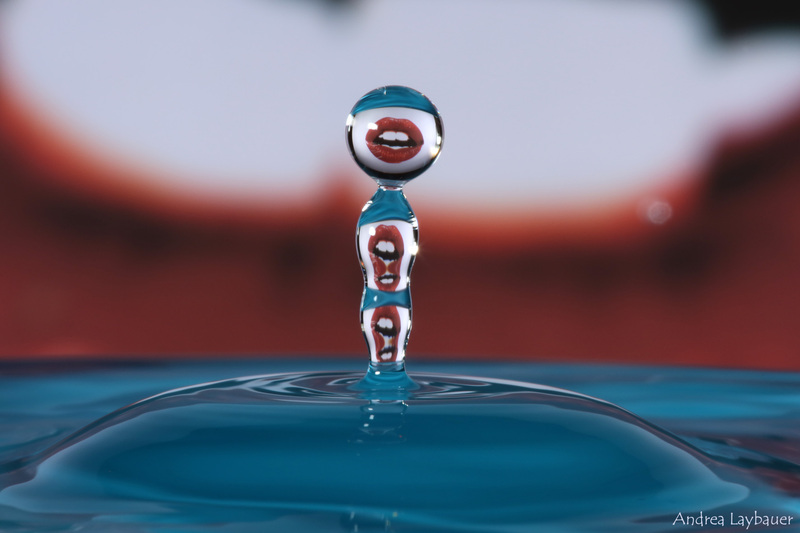 Let's set the set with the mouth background, upside down, and a blue container overflowing with water. The framing will be only the top of the container and a piece of the bottom. 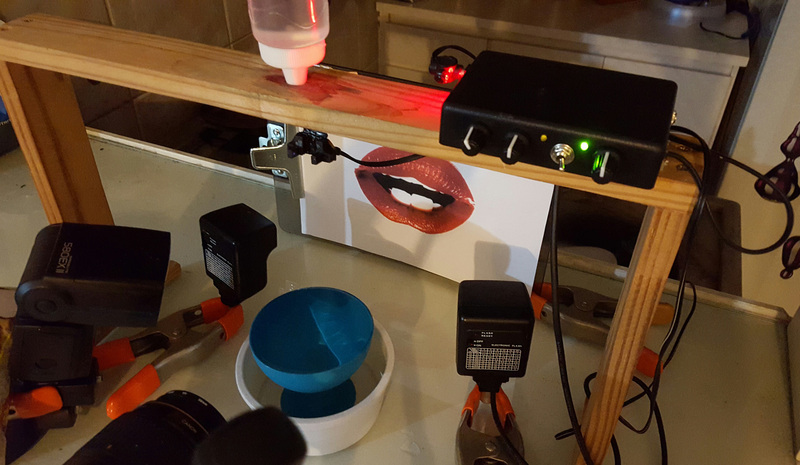 We will use the infrared sensor with its master flash and 2 more that will shoot by photocell - 2 flashes for the background and one for the water. The infrared sensor will be positioned just below the dripper so that the drop passes, breaks the beam of infrared rays, falls into the water and then rises. (See the photo of the making of). Camera in manual mode, manual focus (as usual), camera at 2 or 3 second speed, f.22 (as usual) and flash at 1/64 power (as usual). Leave the iso at 100 but if the photo is dark, increase to 200, then 400, then 800, until the exposure is good. Turn the sensor on and test with your finger. Leave the delay button to 1/4 of the power to test which moment of the falling the flashes are freezing. If you are registering the crown, increase the delay because in this photo we want the rebound. If the drop movement is already finished, decrease the delay. Turn down the lights, trigger the camera, toss a single drop and wait for the camera to close. See the result. If the focus is perfect and the freezing moment is in the rebound, turn off the lights and "it's show time." The reasoning is this: you trigger the camera and you have 2 to 3 seconds to drop a drop exactly in the center of the bowl (where you did the focus previously). The drop passes through the infrared that shoots the flashes and the camera closes. Being in a dark environment, the camera will only capture light from the flashes, thus freezing the movement of the drop. The challenge of this photo is to throw only a drop and freeze the movement of the climb, which is where the reflection of the bottom is perfect. There may be distortions in the image because the water drop is round. If aesthetically interesting, they are welcome (as in the water pillar of our photo reference). The eyedropper (although producing a very small drop) and the ketchup tube can also be used. I confess that I am really enjoying the nasal aspirator but it is a matter of adaptation. The focus on the drop is not good: refocus as many times as necessary and experiment with a variety of things like clothes fasteners, ruler, pencils, and even adapt to one of them. Focus accuracy should be surgical, and every time you tinker with the camera, focus again. The smaller the diaphragm aperture, the more depth of field you will have. Try to keep on f.22. If the movement is not clear, with ghosts: your flashes may be at high power and therefore producing a slow light. Put your flashes in 1/64 power to have a weak light, but fast, around 1 / 30,000 seconds. The flash at 1/1 power usually produces a 1 / 1,000 second light that is too slow to freeze drops. There may also be interference from ambient light. Turn off the lights.